I just finished this and will post a tutorial in the file section within the next couple of days. 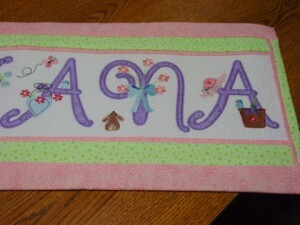 When I do there will also be posted a free alternate A applique letter as well as the applique version of the quilt label that’s posted in the Free Design section. The little bunny is a free download in the free design section. Enjoy. He shows up in a lot of my sewing. It’s the baby bunny. There are two in the free section – one Mommy and then baby. Both stitch out well. Beautiful job! Such gorgeous letters too. Love those. 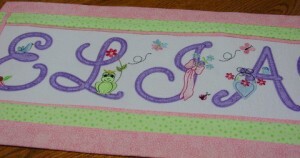 Cindy, did you see the tutorial on how to make the name banner? It’s in my free tutorial section. Our Eliana is Eliana Grace and we do like that name a lot. Thanks for visiting.